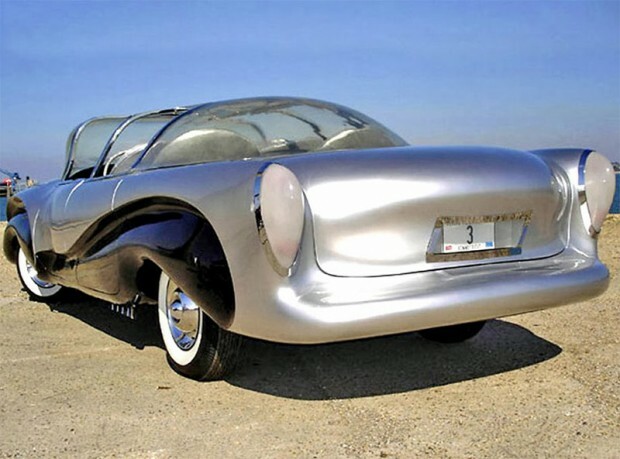 Branford, Conn. – Dubbed by quite a few writers as one of the ugliest cars ever built, the 1957 Aurora prototype was designed by Father Alfred Juliano, a Catholic priest, in Branford. Not necessarily the product of divine intervention, Juliano’s purpose was to create the world’s safest automobile. With money contributed by his Connecticut congregation, Fr. 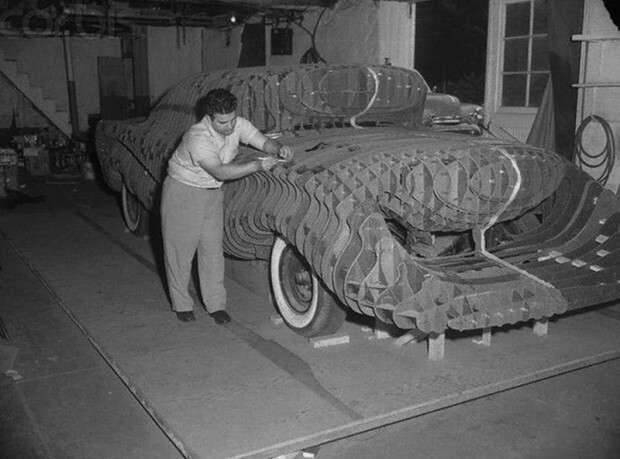 Juliano wanted to build the car and make it available to American automakers to put into production. As it turns out, the gods were not with him and the project went bankrupt after creating just a single prototype. 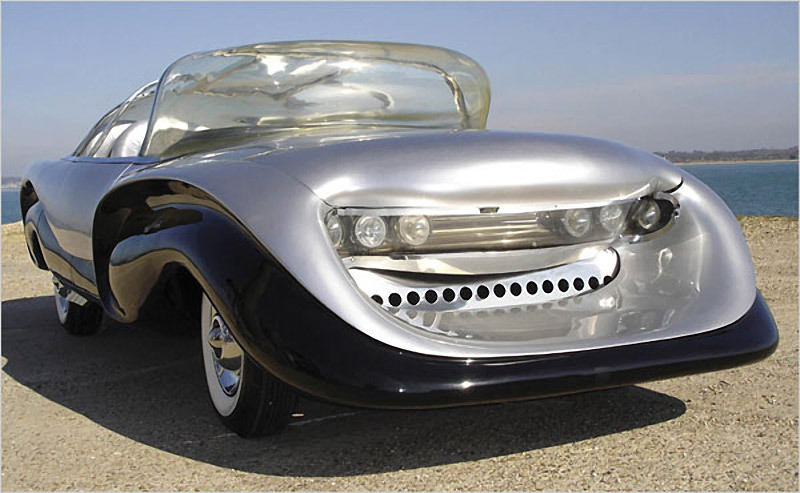 The Aurora prototype was built on a 1953 Buick frame from a wrecked car using fiberglass over a plywood superstructure with plastic windows. The body would therefore be corrosion and dent proof. On the safety side, the car had a built-in roll cage, seat belts, a padded instrument panel, a collapsible steering wheel, and side-impact bars. Even the spare tire was housed under the front end of the vehicle to help absorb impacts. The front end had a “cow catcher” sort of design, filled with foam, to scoop up pedestrians instead of running them over. Perhaps most innovative was that the seats were designed to swivel 180 degrees and face backwards should a collision be imminent. Apparently, when Fr. 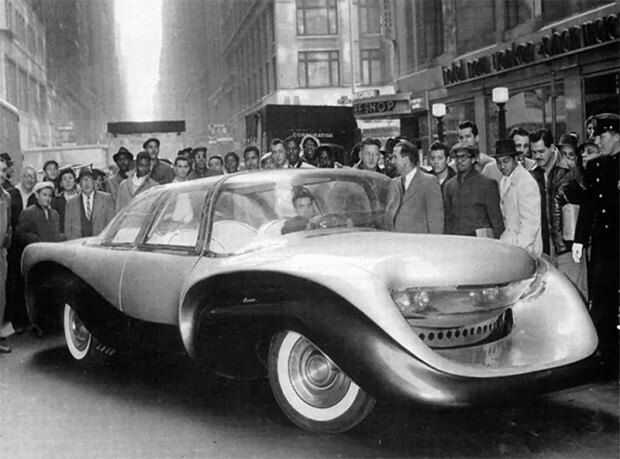 Juliano brought the car to New York City in 1957 for its reveal, he didn’t consider that the Buick engine hadn’t been started for more than four years and the car broke down multiple ties during the journey. The company’s finances were called into question but in fact Fr. Juliano had gone deeply into personal debt financing the company, and eventually declaring bankruptcy, forfeiting the prototype to a repair shop as collateral for unpaid repair bills. It passed through several hands before finally being abandoned behind a Cheshire auto body shop in 1967. Juliano died of a brain hemorrhage in 1989 in Philadelphia. In 1993, the car was discovered by British car enthusiast Andy Saunders of Poole, Dorset, in a sketch in a book about dream cars; “It was so ugly it was unreal. I said straightaway, ‘I’ve got to own that. '” After several years of searching, he eventually tracked the car down by the name of the garage in the background of a photograph of the car, purchased it sight unseen for $1,500, and had it shipped to Britain for another $2,000. 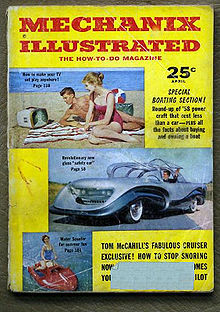 The fiberglass and wood structure of the car proved to have deteriorated terribly from exposure, as well as the interior and plastic windshield. Restoration was further complicated by a lack of adequate documentation or even photographs of the car, the absence of the late Father Juliano to assist as a consultant, and the lack of replacement parts for a prototype vehicle. However, restoration was completed in early 2005, and the car was unveiled to a newly re-astounded public at the Goodwood Festival of Speed and is now on display in the Beaulieu Motor Museum, Hampshire, England. The Aurora is arguably the first Experimental Safety Vehicle ever made, even before the coinage of the ESV acronym.